What does classic mean? That is a whole other discussion, but for the purposes of today, it simply means that using more traditional styles and forms. Topman and J. Crew are currently pushing the shawl-collared jacket, like the one above (from J. Crew). This gentleman, from Berlin illustrates how English style has always involved some sort of tradition. Whether that is Sporting tradition, Military tradition, or just stiff-upper-lip tradition, the Brits have their fashion for a reason. Granted, I realize this man is from Berlin, but it just goes to show you that the utilitarian aspect of American’s lives is not some exceptional quality, we got it from somewhere (hint: it’s England) we just express that utilitarian nature with Carthart and Red Wing boots, and guess what, those are cool now. Score one for the Yanks. I have to begin this post with a simple fact: I admire Newcastle fans. They have to deal with one of the worst owners in Club Football history. They have cash, they have passionate fans, a great stadium, yet misfire. I wonder if it has to do with firing a manager every 10 minutes? 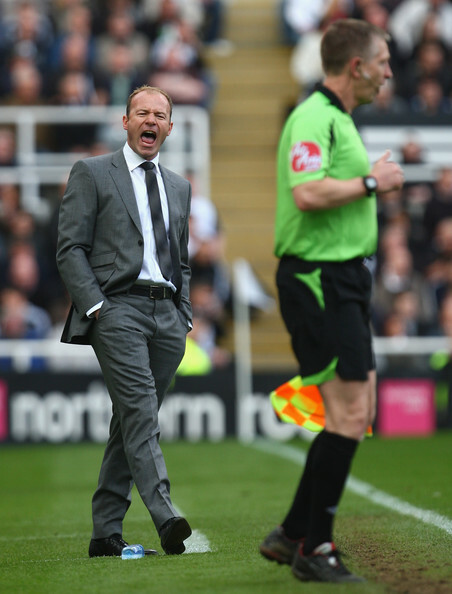 Alan Shearer seems to have energized his squad, and dare I say it has to do with his clothes? It hasn’t exactly been spring time weather, at least not on the East Coast of the States. 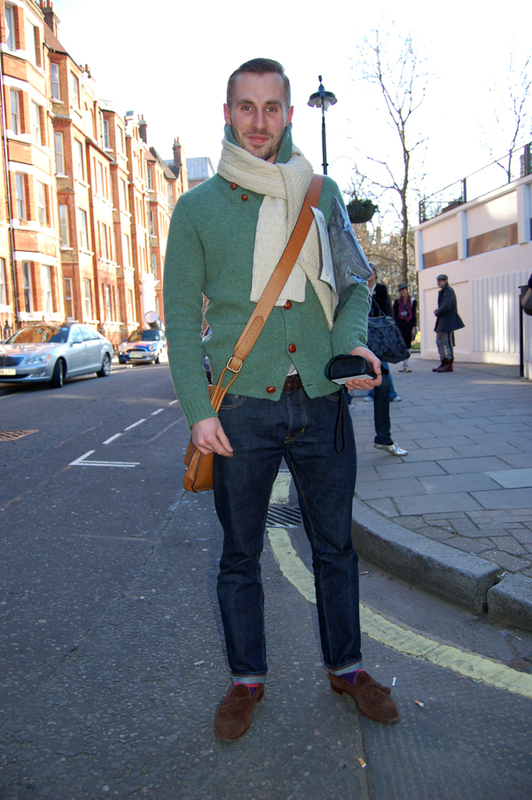 This gentleman from London illustrates how to incorporate spring-time color even when there isn’t spring-time weather. An article out of the New York Times has highlighted the plight of the English tailor. The recession, coupled with an ever-strengthening dollar, has led to prices falling for their customers from across the pond. Now, they haven’t lowered their asking prices in pounds, but since your George Washingtons will be worth more over there this would be the time to get a bespoke suit if you were ever thinking of dropping that kind of money. For example, Stuart Lamprell, whose suits used to sell for $4,400 are now going for $3,100. The tailors realize this isn’t a bargain, and they are not exactly going to try and market themselves that way. However, if you are the kind of guy who throws down over $1,000 on a Hickey Freeman you might as well put more money down on a suit that is custom-made for you rather than have a stiff and boxy suit you’re stuck with. Don’t look at it as three times the price, look at it as the money you put down and you won’t have to spend again for years. The key here is not spending money, rather, it’s not wasting it. Warm weather is coming. That means brick-red pants, little animals on ties, and–of course–white shoes. Before you get nightmares of white bucks, check out the pair of Paul Smiths above. They are quite subdued (compared to most of Smith’s work) and as per usual of Sir Paul, they are well-made. 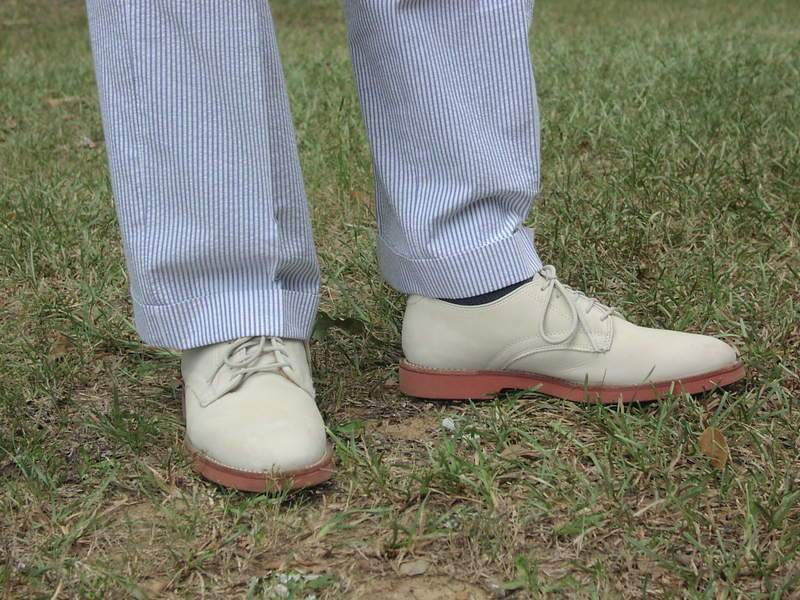 You can check out a pair at Paul Smith’s online store here. As winter increasingly lingers on, there seems to be a yearning in fashion circles to inject color despite the cold weather. This gentleman from London illustrates how to combine bright colors with warm clothes.